If you think fashion is only for the grown-ups, think again. With kids fashion and children wear market coming of age; it’s now not unusual to see tiny tykes successfully walking the ramp for their favorite brands like veteran models. Thanks to media, social media, reality T.V. shows and rapid expansion of international brands like U.S. Polo, Flying Machine, Marks & Spencer, Adidas, Nike and H&M – all of which are top 10 kids wear brands; children today are more aware of trends than ever before. 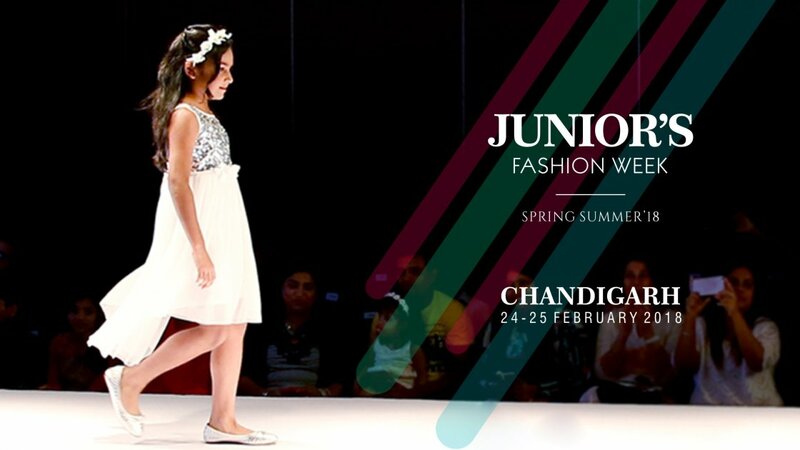 And by debuting kids fashion week in Chandigarh, Junior Fashion Week, a fast growing organization dedicated to celebrating young talent has taken this infiltration of fashion into children’s clothing a notch further. Some twenty days back, Chandigarh hosted its first kids’ couture show at J.W. Marriott and I had the pleasure of witnessing not only a kids fashion show for the first time but also the thrill of watching my own son walk the ramp for fashion brands. When it comes to fashion shows, they are truly different. Set in the most exquisite and luxurious locations, these events have an air of elegance that one craves. The decadence is indulgent and I love indulging. But fashion chat at the Kiddie show was quite different. 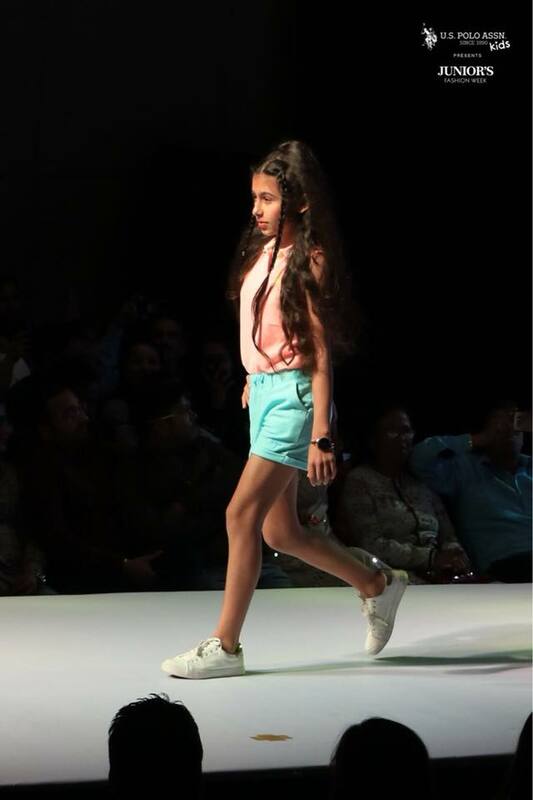 Unlike the youthful glow that people lust for in fashion shows, the fashion chat at Junior Fashion Week, I witnessed in Chandigarh was filled with child jargon and cheers like – “So sweet”, “Oh, so adorable”, “Cutie pie”, and so on. Soft, delicate music played as the fashion crowd sauntered in to take their seats. Photographers and media people on one end of the front row and brands and organizers of the show on the other end. Gradually, soft music turned into the coolest one as kids started showing up on the runway, poised and dressed up like models for the season’s biggest junior fashion event. First to walk was a girl representing the brand US Polo Assn Girls. Owning the stage completely, she walked the entire catwalk like a star. With cameras clicking, music pumping and tiny tots trotting like pros the whole experience was surreal. Children adorning the best of fashion trends kept pouring in and enrapturing audience with their stellar stride. 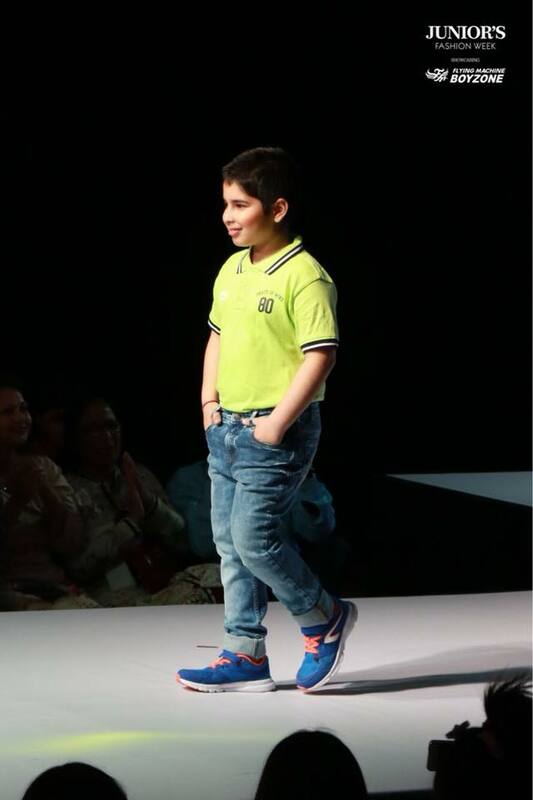 And then, after what felt like an eternity the moment I was waiting for with baited breath arrived – my 8 year old finally appeared on the runway in the coolest spring summer look of 2018 by Flying Machine – neon green t-shirt matched to perfection with blue denims. I couldn’t believe my eyes. He was there. My son. He looked so different. Not the clumsy little boy whom I keep pestering to do homework, moaning at to change his dirty clothes after school. He’s a model. He’s on this runway. And he’s walking up the ramp like a cool dude. My son who is a far cry from grace and composure has magically started behaving! He’s doing the catwalk and I’m literally shaking. I feel like crying. I feel like hooting. It’s me, who needs composure rather than him at this moment. I held my breath as he walked from end to end with an air that I could not even dream off. The pressure not to fall, not to go wrong, to own the stage like a model is tough stuff. But he’s doing it. Cameras flash. He strikes a pose. All eyes on him and he doesn’t falter. I’m living a dream! He’s my son but for everyone else in the gathering, he’s someone else. He’s a model. My emotions are tangled. It’s one of the strangest feelings in the world to see your child through different eyes. Proud mama moments – yes but there’s more to it that I can’t find difficult to determine or figure out. While, I have no desire to entertain a career in fashion for my son but I am so much overtaken by his magical transformation that I have made a mental note to reach out to JFW for their next show.